Welcome to Curin family house. We have been running this guesthouse for over 25 years and treats every guest like an old friend. 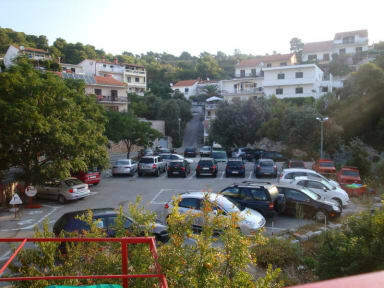 The house is located in a residential zone - west side of the town Hvar, 14 minutes to get the centre of town. And 5 minutes to reach the main city beach, Momo beach, Hulla Hulla beach and bar. All room have private ensuite bathroom. 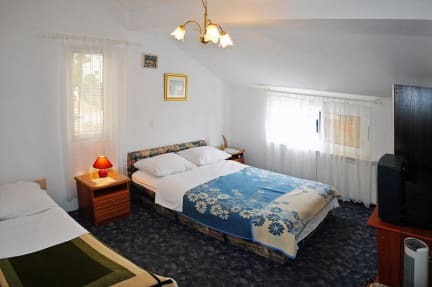 We have :--Single rooms come with comfortable single beds, twins with two single beds, the triple room is made up of a double and one single bed or three single beds and quadruple is with double bed and 2 singles. Bed sheets, linen and towels are provided. Each bedroom has a private en-suite bathroom with 24hour hot shower, Satellite TV and a terrace or balcony. A market for food and drinks is just 20 meters far from the house.Pizzeria and restaurant PRIMI PIATTI is just 20 meters far from the house.. Please note: Check-out time is 10:00 am and check-in time is preferably at 13:00 pm. If you need to arrive at any time please just let us know beforehand. Come stay with us, where you’ll be at home in our house! Within 12 hours of booking we will contact you via email. Every room has Air-condition. To use Air condition it is 5.00 Euro per day per room. SPECIAL: 30 minutes free internet access dayly. FREE INTERNET - Web Access and WiFi. We have no curfew,no lockout! Free short term luggage storage. It takes about from 10-12 minutes to get to the centre of town, and 3 minutes to reach the sea and beaches./main city beach- AMFORA BEACH RESORT and 2 minute for HULLA HULLA BEACH BAR/. SPORT UND TENIS center are 250 m far. Market with food and drinks are just 30 m far. There are many amenities just a short walk away including an indoor swimming pool with sea water, a gym, bowling centre, sauna, massage and fitness centre and tennis courts. *We are not a 24 hour party hostel. Kitchens and terraces are open till 11 pm (due to Croatian law). After this, guests are kindly requested to leave the property / and go out and to discover Hvar night life. If they want to continue with their group gathering and partying so other guest can sleep in peace. * All the rooms in house are private rooms and no visitors are allowed. exception only:when necessary and justified with previous permission of manager of the house. *Try to include your mobile number so we can reach you on arrival day. Firstly, we wish you a pleasant stay in our accommodation and hope you will enjoy your time. We ask you to use our accommodation as you would your own home and to treat the equipment provided with respect including the material belongings of others. In order for you to get the most out of it, we recommend you to follow these few simple rules. These will avoid any misunderstandings and will ensure that the house/apartment stays in good order. The house is situated in quiet environment and especialy AFTER 23.00 pm-07.00 an loud music,any loudness and any activietes on terrace are NOT ALLOWED. •We kindly ask that you respect us and neighbors and respects this rule. •No parties and events and at any time in house. •PARTIES AND EVENTS ARE ALLOWED IN AND AROUND HULLA HULLA beach bar or Momo beach - just 100 m far from house. •No strangers and visitors are allowed, however any visitors after previous approval by manager. •House has a zero tolerance policy on parties being held in the apartments. House reserves complete discretion when interpreting and implementing the House Rules for the purpose of protecting its assets and the safety and comfort of all guests. It is further understood that breach of the House Rules will result in immediate eviction with 100% cancellation charges for remaining nights. Be aware that this rule will be strictly conducted.